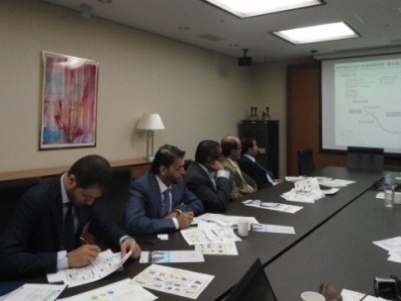 The mission from the Permanent Emergency Committee, Ministry of the Interior of the State of Qatar headed by H. E. Brigadier Hamad Othman N. Al-Dehaimi, Director of Operation Department and Secretary General of Permanent Emergency Committee has been taking a survey tour in Japan since May 23rd, 2015. The objective of the mission which is composed of 5 officials from the related ministries and the public corporation, is to obtain the updated information on the technology, safety measures and regulations of Japan’s town gas system, the scheme of the national resilience and the disaster risk management of Japan at Ministry of Economy, Trade and Industry, Fire and Disaster Management Agency, National Resilience Promotion Office, Cabinet Secretariat and Office of National Space Policy, Cabinet Office. 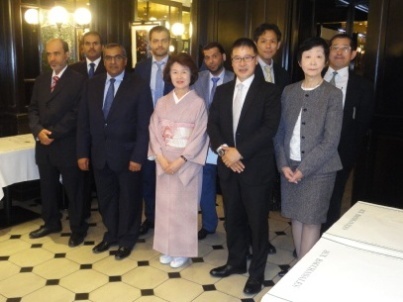 The State of Qatar and Japan have recently facilitated the mutual visits of VIPs, represented by the visit of H.H. Sheikh Tamim Bin Hamad Al-Thani, the Emir of the State of Qatar on February 19th to 20th, 2015. A Joint Statement on Promoting and Expanding Cooperation under the Comprehensive Partnership between Japan and the State of Qatar was announced upon the occasion of the meeting of His Highness and H.E. Shinzo Abe, the Prime Minister of Japan. JICE held a welcome luncheon for the mission hosted by Ms. Sachiko Yamano, President of JICE on May 24th. Ms. Yamano and other 4 JICE members presented the luncheon, where no end of topics were talked about in a very friendly mood, and especially the topic of youth exchange programs in the field of soccer proposed by Mr. Erito Uchiyama, Senior Assistant to the Secretary General of International Exchange Department of JICE and also a member of International Committee of Japan Football Association was welcomed by the mission whose country will have the World Cup Soccer Game in 2022. 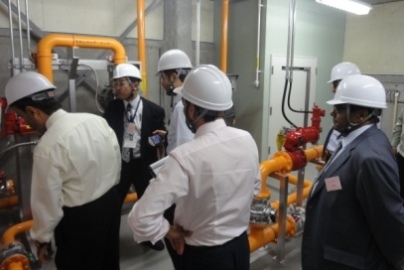 The mission is continuing the survey tour in Osaka, visiting the facilities arranged by Osaka Gas Company, Ltd. and deepening the holistic knowledge about the sophisticated town gas system and its safety measures. The mission will leave Japan on 30th of May. Lecture at Osaka Gas Co., Ltd.